A Mish Mash Sort Of Dinner | One Picture, A Million Words. Tonight is different from our usual. Tonight, my husband and I are doing something that we should be doing more often. We are going out for a meal at a nice restaurant for our five year anniversary. So, I put together a pasta dinner for the kids by using ingredients that are already in my fridge and pantry. 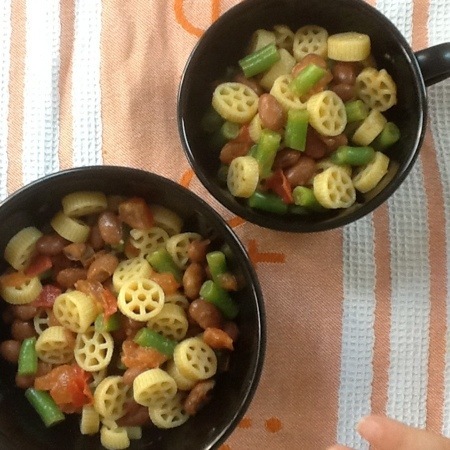 Wagon wheel pasta with green beans, borlotti beans and tomato. Carbs? Check. Veggies? Check. Protein? Check. Kid friendly? Check. If you want to add a touch of whimsical to your meal and make the kid(s) in your life happy, just boil up some wagon wheel pasta. I guarantee any kid who loves pasta will go crazy for them. Mine did, at least. Next > S’mores. Bars. Fail.